WE CLEAN GUTTERS LLC technicians are trained in proper ladder safety and comfortable in climbing tall heights to clean and repair gutters for your home. If you decide to work on your own gutters and downspouts, please read the post below to ensure you are safely using your ladder for the project or visit this link for our service. Did you know approximately 250,000 Americans get injured and require medical attention from misuse of ladders? The American Journal of Preventive Medicine reported that 97% of these accidents take place at home. This can occur when changing a lightbulb, painting a ceiling, when cleaning gutters outdoors or during several other common household projects. That’s an alarming percentage that should not be ignored. If you had no idea just how dangerous ladders can be, I’m sure you can now see how important it is to practice ladder safety at all times. Although all ladders can cause accidents if you are not careful, some ladders put you at more risk compared to others. That is why you need to carefully think about the type of ladder you want to buy if you don’t have already or are thinking of getting another one. A majority of electricians use wooden ladders or those made from fiberglass because of their inability to conduct electricity. It is particularly vital if your work area has wires or power lines. Some people prefer aluminum ladders because they don’t have any weight and they are less costly compared to ladders made from fiberglass and wood. However, they are not suitable when working around electrical wires because they are good conductors of electricity. Another factor you should consider when buying a ladder is its maximum load capacity. The weight rating of a ladder is the total weight of an individual it should carry (that is you in this case) plus the tools you will put on the ladder. A majority of home projects can use ladders whose ratings are I, IA, and IAA. These ladders can accommodate 250, 300 and 375 pounds respectively. Since you know how much you weigh, you should know the maximum weight of materials you should add on the ladder to avoid overloading it. 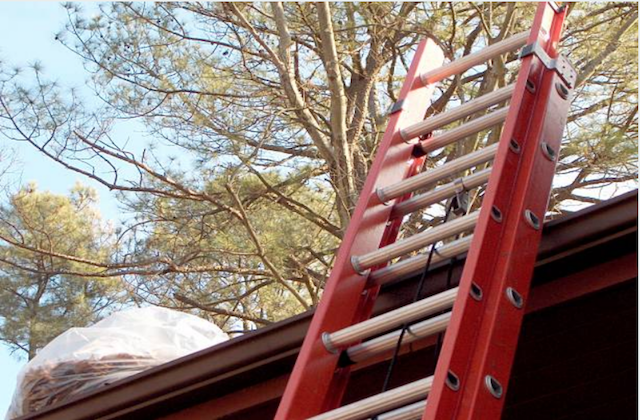 Using a ladder that is not the right height for you increases your chances of having a fall. That is why you need a ladder that doesn’t make you overreach or have to stand at the top two highest rungs of the ladder. You will be comfortable standing on the third, fourth, or fifth rung if you are on a stepladder and the fourth and fifth rung if you are on an extension ladder. If you do not know which ladder height to choose from, go for the taller one. That will probably be right for you. You would be surprised at how many people skip this vital step and go straight to climbing a ladder. Sometimes, we can avoid the accidents we get on ladders if only we take time to inspect the ladders thoroughly. If you are using wood ladders be sure that the rails are not broken, the connections are tight, and the rungs do not have cracks. If the ladder is made from fiberglass then check the rails to be sure that they do not have holes or cracks in them and that they are not worn out. If you have an aluminum ladder then look at the rails to be sure that they do not have creases, are not twisted and do not have any deformity. It is essential to have your hands free when climbing a ladder because you will use them to hold onto the ladder. It will prevent you from tripping and falling. You will also be able to see the place where the top part of the ladder joins with the lower portion. Ensure to have a rope or tool belt with you because it will come in handy when you want to get something from the ground to the ladder and vice versa. Having your ladder at the right angle will make it stable and significantly lower your chances of getting an accident. If you are working on a building and you put the ladder too close to it, there is a chance it might slide when you tip towards a particular direction. This can be dangerous because you will fall off the ladder and maybe have the ladder fall on you too. Experts recommend that you use the 4-to-1 rule to avoid this. This rule dictates that the base of the ladder should be placed about one foot from the wall for every height of 4 feet. Ladders have locks, and this should be secure otherwise the ladder might buckle and take you with it. Look at the rung locks on the extension ladder to be sure that everything is okay. Another thing you should check for is whether the top section is slid in the lower part. Make sure you do this before you get on the ladder. If you have a stepladder, then ensure to extend the rail spreaders to their maximum limit. One of the reasons people get accidents on ladders is when the ladders are on shaky ground. When the ladder is not in a stable place, it cannot carry its weight and your weight, and it will buckle. Firm ground is one that is even. If the soil is uneven, then you can level it by removing some dirt from the high ground sections. You can have your ladder stand on a wide plank. This will provide stability. When you are sure the ground is stable then you can put the base of your ladder. If you want to test whether the earth is stable, check if the ladder rocks or wriggle. If it doesn’t do that, the ground is stable. It is important to note that ladders shouldn’t be placed on the icy ground for the simple reason that ice is not stable. It will melt, and your ladder will be left unstable therefore exposing you to accidents. It is true that we cannot completely avoid accidents because some of them are unforeseeable. However, a considerable number of accidents can be prevented if people took the necessary precautions while working on ladders. It may seem like a waste of time to go through these steps, but they may save you from a lot of pain and inconveniences. WE CLEAN GUTTERS LLC is trained in proper ladder use for climbing to the top of homes and businesses in order to safely repair and clean gutters. If you are not comfortable climbing a ladder to the necessary height to perform these jobs and live in our service area, please call us! Do not risk serious injury in order to save a few dollars on gutter cleaning for your home.